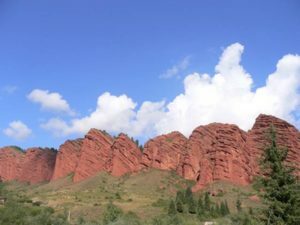 Kyrgyzstan - the land of sky mountains. 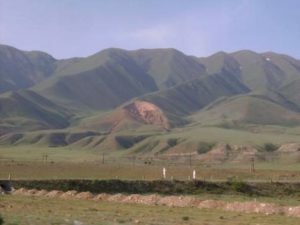 Your guide will pick you up at Uzbek-Kyrgyz border and accompany you to Osh city (40 min. drive). 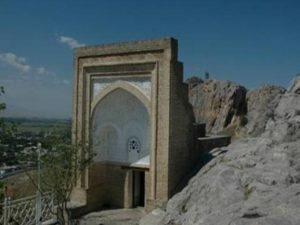 In Osh city you will go for a walk there and visit the most famous place – Suleiman Mountain. 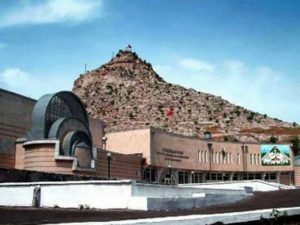 Suleiman Too (Solomon’s Mountain) is situated in the center of the city and it is considered to be a pilgrimage place for local Muslims.According to the legend, biblical prophet Solomon (Suleiman in the Koran) was buried at the foot of it. After it we will visit an Asian bazar.Night you will spend in a local home stay. Today we will drive to Arslanbobwalnut forest. The road takes about 6 hours and again you will drive along a mountain road. 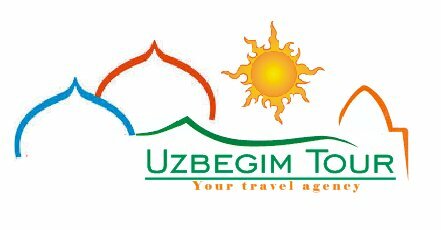 On the way we will visit Djalal Abad town and its famous UzgenTower. 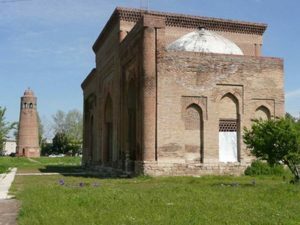 This tower was built in 11th century by Karakhanids. There are also there mausoleums that were used as burial places for the leaders. 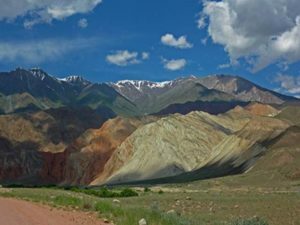 The whole road will surprise you by its celestial mountains and excellent panorama views. Arslanbob’s grove produces 1500 tons of walnuts per year and is the largest single natural source of walnuts in the World. Night you will spend in a local home stay. 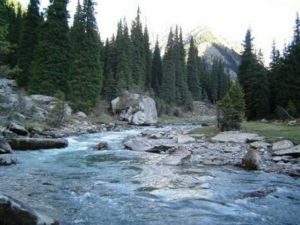 After a night in a home stay, in the morning we will have a walking tour in Arslanbob walnut forests, covering 11,000 hectares and sometimes called the “Royal Woods of Kyrgyzstan”. It is known that nuts from this area were exported along the Great Silk Road in the Middle Ages. Here we can enjoy the wonderful nature and have a hike to a small waterfall. There are many incredible places. You will be able to communicate with locals. This night will rest in a home stay. In the morning transfer to Kazarman village. 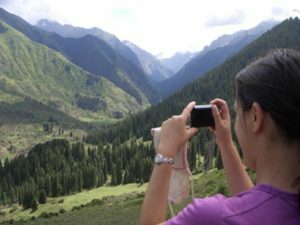 We cross top of Ferghana range – Kok art pass 3300 m. We change woody zone of Ferghana valley to the zone of wild mountains. 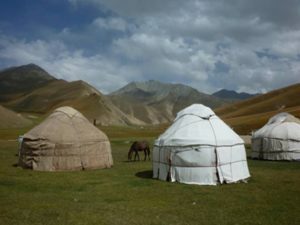 We meet some nomads with their yurts living in Kyrgyz paradise. We take picnic. In the evening walking in Kazarman village. In the morning transfer to Song kul lake. 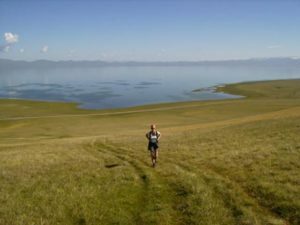 Today we visit the wildest places in Kyrgyzstan. 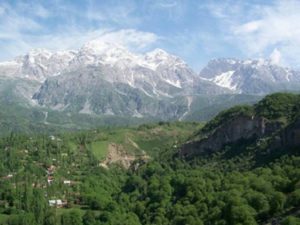 Wild animals: eagles, wolfs, bears are living in this region. Sometimes we stop to enjoy the nature. In the evening exploring the nomad’s life. Diner and night in the yurt. Diner and night in the yurt. Today we will walk and meet real nomads. 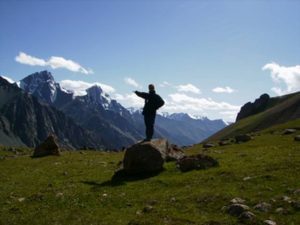 It is a great chance to be acquainted with nomadic traditions and culture. All nomads are very hospitable. They will always invite you inside their yurts to drink tea with them. They are not used to seeing many tourists and are always happy to speak with you. Hospitality is one of the main laws among nomads. The used to say: “Guest is sent by God”. Therefore, they cannot just let you pass without having a rest with them. A traditional dinner will be served in original nomadic houses – yurts. You will get to spend the night in yurts as nomads do. After a 9:00 AM breakfast you will have free time at Son Kul Lake, to explore nature on your own. You can ride along the lake on a horse, or just relax and soak in the calm atmosphere of the lake side wilderness. Also you will have time to communicate with nomads and have a glimpse into their way of life. Lunch will be served at 2 pm. Then we will drive to the town of Naryn which is situated right in the gorge. 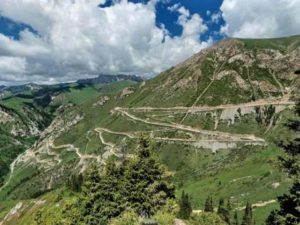 The drive to Naryn traverses over one of the most beautiful passes, along the top of a mountain. Dinner will be served in a local restaurant at 7 pm. Night will be spent in a guesthouse. Today we will see confluence of Big and Small Naryn rivers. We enter to Kichi Naryn gorge. 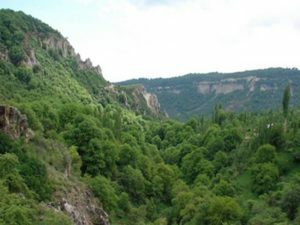 We cross small hills and woody zones of this amazing gorge. 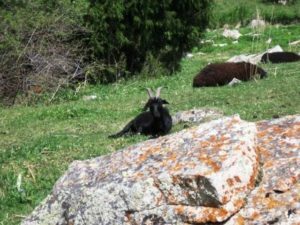 Incredible day to discover the most beautiful mountain pastures. Walking. Picnic. 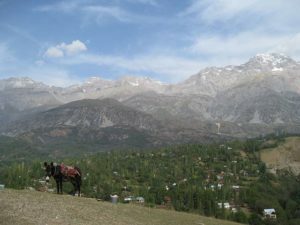 In Kochkor we visit small handicraft museum. We participate in carpet producing. Diner and night in local house. 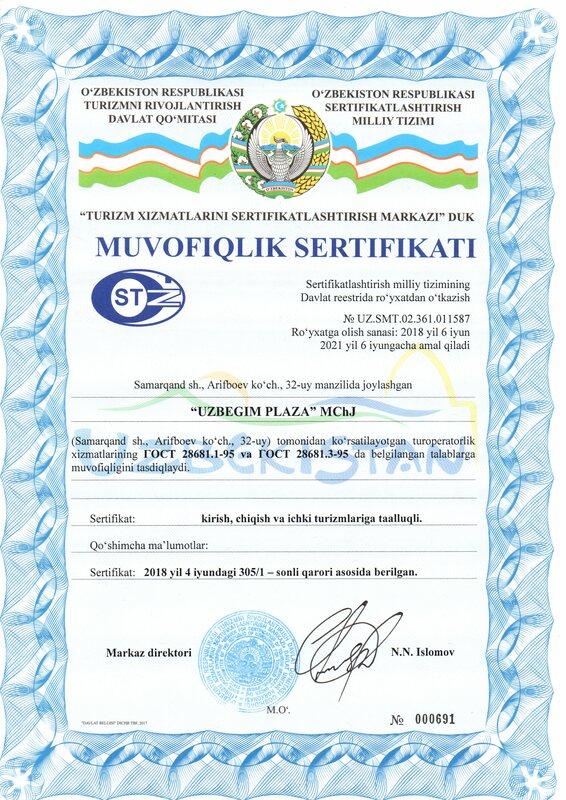 Today you will be transferred to the celestial Issyk Kul Lake, the second largest alpine lake in the world. The lake is called “the pearl of Central Asia”. 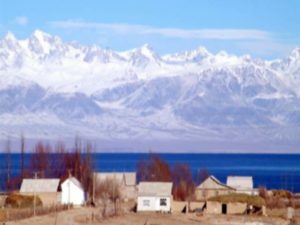 For more than 1 500 years local people considered the lake to be a sacred one.You can come up to the lake and to see mountains all around it. We will have a break in Bokonbaeva village, where we will visit a local eagle-hunter. 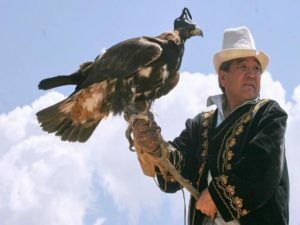 He hunts hares and foxes with the help of eagles (traditional way of nomads hunting). Then is transfer to Tamga village. Your dinner will be served at 7 p.m. in theguesthouse, where you will also spend the night. Today we will drive 2 hours to Barskoon gorge where we will start our trekking portion of the tour. 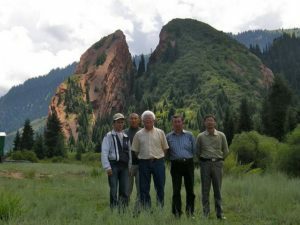 There is a road along the gorge, which connects Issyk Kul valley withthe valleys of Inner and Central Tien-Shan. 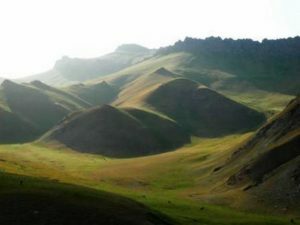 In the beginning of the gorge, its slopes are covered by steppe flora and sparse bushes. At 2800 meters above sea level, juniper forests appear. Also on the way, you will see a very beautiful waterfall. During this day, we will hike high in the mountains and you will see many small mountain lakes. Return to Tamga. Night in guesthouse. Today we will drive to JetiOguz gorge. It is famous for its red rock formations that are called the Seven Bulls – JetiOguz. Also you will see Broken Heart Mountain. We will take as many photos there as you would like and if you want, it is possible to walk to the top of a mountain (20 minutes) to see a panoramic view of the gorge! 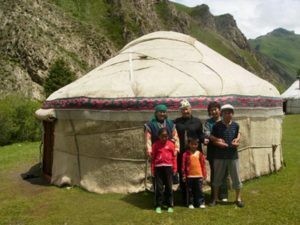 There are yurts in the gorge and people can offer you Kumis to drink. 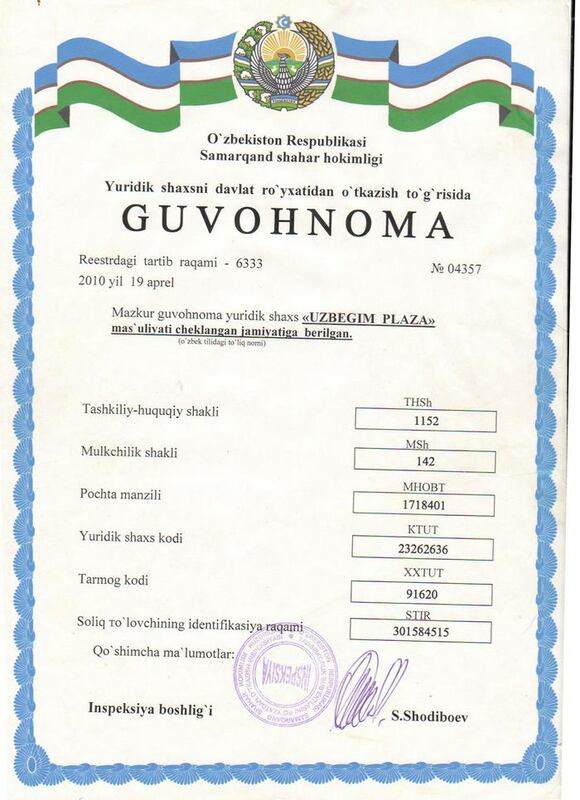 It is a national drink that is made from fermented mare’s milk, and it is mildly alcoholic. Your dinner and night will be in nomadic felt dwellings, yurts. Your guide will pick you up at 8 a.m. 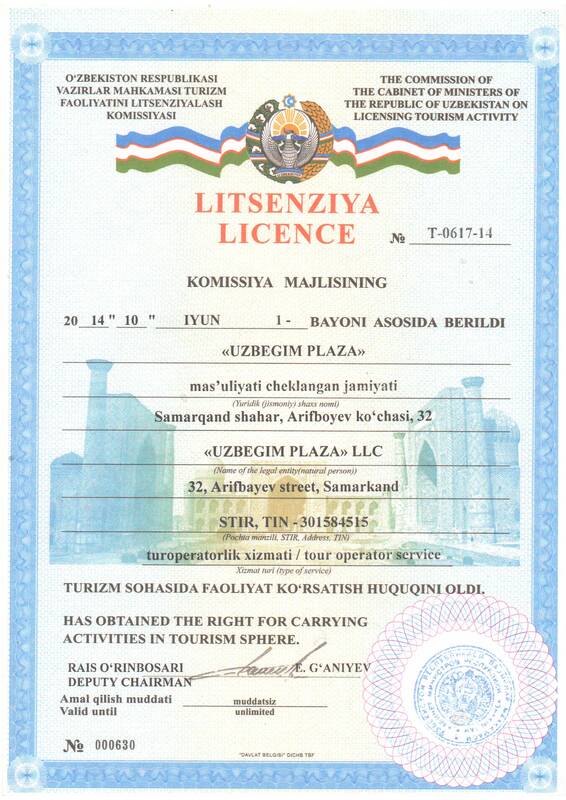 Afterwards you will be transferred to Issyk KulLake. 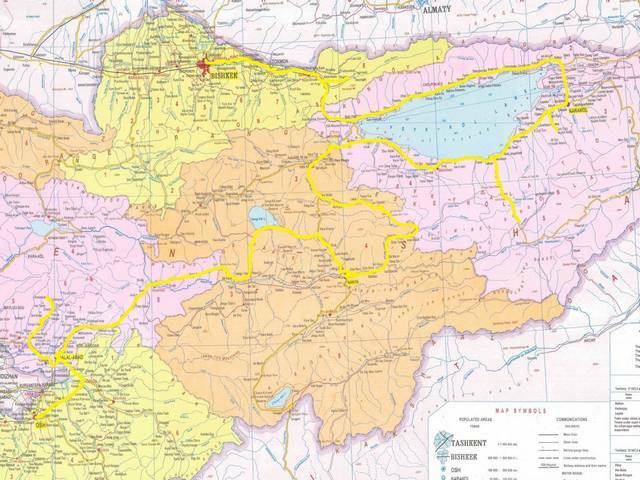 This time we will drive along the southern shore of IssykKulLake. This is a great chance to see the whole lake from all sights. 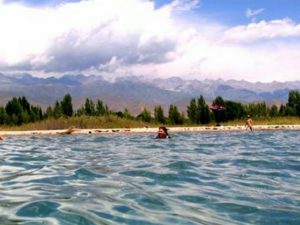 It is not just the biggest mountain lake in Central Asia but also the favorite place for swimming in summer time. People come to have a rest to the lake from the whole neighbor countries. 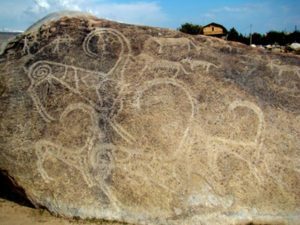 In the afternoon you will visit a small local museum that has examples of handicraft, music instruments and a lot of artifacts. Your dinner and night will be in a home stay in Chon Kemin village. Today you will have a transfer to Bishkek to have a City Tour. 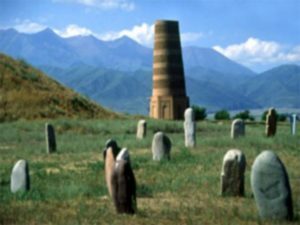 On routeyou willvisit Burana Tower (an 11th century minaret) and an open air museum of Balbans (stone warriors). 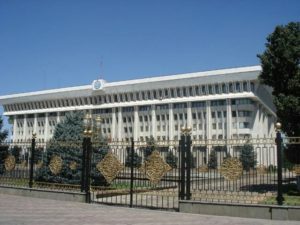 In Bishkek you will visit Pobeda Square (Victory Square), Duboviy Park (Oak Park), Central Ala-Too Square, the History Museum, National Philharmonic, and many others places of interest. But no tour of Bishkek is complete without visiting our Asian Bazaar! We will show it to you today and you will be able to take a lot of dynamic photos of bustling local life. This bazaar is a noisy and colorful tapestry of fabrics, produce, and people selling and buying goods.Traditional dinner will be served at 7 p.m. Night is in ahotel. 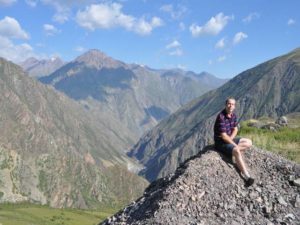 Day 14: Bishkek-Flight to home country.